Many people think of stretch marks as a problem that only women have to deal with after giving birth. While it is a common issue for new mothers, stretch marks do occur for reasons other than pregnancy and can affect both males and females. Stretch marks, also known as striae, are long, narrow streaks that develop on the skin and cause scarring. They form due to stretching of the skin, specifically as a result of weight loss, pregnancy or growth spurts during puberty. The scarring happens when the skin is unable to bounce back after intense growth or weight reduction. It is a myth that stretch marks form only in women. Both the sexes can be affected by stretch marks. In fact, approximately 70percent of girls and 40percent of boys develop stretch marks during puberty. Pregnant women often develop stretch marks after the 25th week of pregnancy. And stretch marks from weight loss obviously can affect men or women. 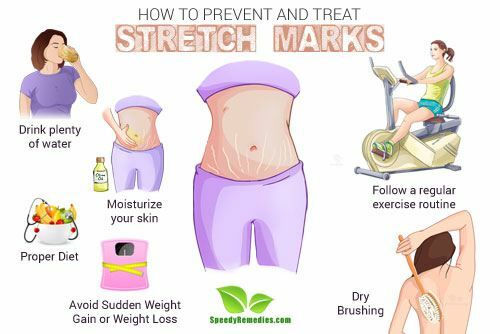 So, if you notice your skin turning thin and pink, this is probably the first sign that you are developing stretch marks. Slight irritation and itching is also indicative of stretch marks. The skin is composed of three main layers:the epidermis (outer layer), the dermis (middle layer) and the hypodermis (the deepest layer). Stretch marks form in the middle layer when the connective tissues stretch beyond their levels of elasticity. It is always advisable to take preventive measures before you end up dealing with the problem. You can use the following tips to help minimize the chances of stretch marks and scarring. Many of the same tips can help treat stretch marks and restore your smooth, even-toned skin. Keep yourself hydrated by drinking at least 8 to 10 glasses of water. Well-hydrated skin is flexible and poses less risk of stretch mark formation, as the water helps maintain elasticity. It will also leave your skin feeling fresh and rejuvenated. Moisturizing your skin is particularly important for the prevention of stretch marks. Massage your skin regularly with moisturizers for improved circulation and growth of new tissue. Egg whites: The amino acids and proteins in egg whites help heal the stretch marks and contribute to rejuvenation of the skin. Put egg whites from 2 eggs in a bowl. Apply this paste on the affected area 3 times a day for at least 10 minutes. Follow this with an olive oil massage for a few days and watch your stretch marks fade away. Lemon Juice: The bleaching property of lemons proves highly beneficial for bleaching and fading away stretch marks. Put some lemon juice in a bowl. Optionally, you can also mix in some cucumber juice. Massage the juice onto the affected area in circular motions. Shea or Cocoa Butter: Known for its anti-aging property, cocoa or shea butter acts as an exceptional moisturizer for the skin. It promotes proper blood circulation, thereby reducing stretch mark scars. Gently massage about 1 tablespoon of cocoa or shea butter onto the affected area. Repeat twice a day for at least 2 months for your stretch marks to go away. Olive Oil: Rich in vitamin E, olive oil has a hydrating & cooling effect on the skin and helps in restoration of skin tissues.Thus, this provides for prevention and treatment of stretch marks. Heat the oil slightly before applying it onto the affected area. This promotes better blood circulation that will ultimately reduce the visibility of the stretch marks scars. You need not rinse it off after application. Potato Juice: Rich in vitamins and minerals, potatoes help in growth and repair of skin cells, thus, contributing to prevention and treatment of stretch marks. Rub a slice or two onto your skin for 10 to 15 minutes. Let the juice dry on its own, and let it remain on the skin for another 10 minutes before rinsing it off. Use regularly for a month to get rid of stretch marks. Eat a healthy and balanced diet to avoid extreme weight gain or loss. Consume more low-fat dairy products and other foods rich in vitamins. Vitamin A, for example, encourages the growth of new cells. Foods like carrots, apricots, liver, sweet potatoes and green vegetables are rich sources of vitamin A.
Vitamin E promotes healthy skin and repair of damaged skin. Also, vitamin E helps the body regenerate vitamin C. Good sources of vitamin E are avocados, nuts, dairy products and sunflower seeds. Fresh produce like berries, citrus fruits, kiwis and bell peppers are rich in vitamin C and thus contribute to protection of the skin and limiting of stretch mark formation. For proper protection and nourishment of the skin, also incorporate foods that are rich in antioxidants like strawberries, spinach and blueberries. Collard greens, avocados, nuts,seeds and green vegetables like broccoli are helpful in protection of cellular membranes of the skin. So, include these in your diet. Include zinc- and protein-rich foods like fish, nuts and eggs in your diet for regular and healthy synthesis of collagen. A sudden gain or loss in weight is a major cause of stretch marks. Avoid this! Try maintaining your weight through proper diet and exercise. Avoid eating frequently. If you have cravings, eat fruits and nuts so that you can maintain your weight along with healthy eating. One common myth associated with pregnancy is feeding the body for two. Do not eat for two. Eat only as much required. A regular exercise routine helps maintain the elasticity of the skin, which can prevent stretch marks. Also, proper exercise contributes to weight management, which is the most important factor in preventing stretch marks. Use preventive creams regularly and prior to pregnancy in order to prevent stretch mark scars toward the last few months of pregnancy. Keep the skin supple by using products that are specifically formulated to increase the elasticity of the skin. Practice dry brushing on the body. This provides proper exfoliation of the skin that ultimately helps in reducing stretch marks by cleaning the dead cells away.